Animated Film Reviews: 1962 Comedy Routine Animation "Sale of Manhattan"
This is a trip back into the past, the early '60s, when kitsch was in fashion and humor was pure corn. 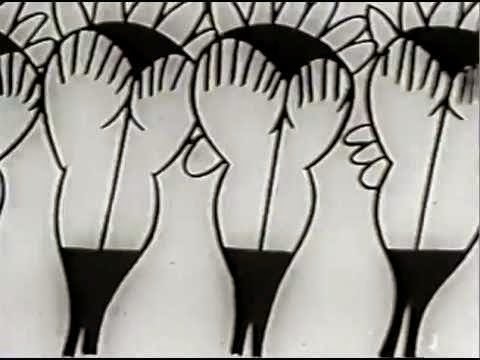 The most amazing thing about these old animations is that it shows what people thought was amusing back in the day, it is an education in how completely humor changes in just a few decades. In brief, this is an animated segment directed by Fred Crippen and designed by Saul Bass & Art Goodman from Stan Freberg Presents The Chun King Chow Mein Hour: Salute to the Chinese New Year (February 4, 1962). Soundtrack is from Freberg's album "Stan Freberg Presents The United States Of America". Saul Bass was the genius of title sequences who did, among many other animations, "North By Northwest" and "Psycho." The famous "James Bond" title sequences were derivative of his inspiration. While Freberg was the "name" attached to this project, Bass was the true talent.